We are very excited to announce that we will be hosting a wine dinner with B.Wise Winery on Wednesday, May 1st at 7:30pm. These wines are great value and delicious! One of the wines (Brion) is extremely allocated but everyone in attendance will get to try it and have an opportunity to buy some! The menu and some more information on the winery can be found below. We hope to see you on May 1st! B. Wise is a wine project founded by proprietor Brion Wise that brings together the best that Sonoma and Napa vineyards have to offer. As part of that, we sought winemaking expertise that would allow us to take the best advantage of extraordinary vineyard sites. In 2002 we began working with Massimo Monticelli, who came to us from Silver Oak, as the winemaker for the B. Wise Estate. Mark Herold brings us depth in our Napa Cabernet portfolio from his pioneering oenology work for Joseph Phelps and his own successful Merus Cabernet. Rounding out our Pinot Noir portfolio, we include an offering from the classic region for that grape, the Willamette Valley in Oregon. Drew Voit, former winemaker for Shea Vineyards in Oregon, has joined us to work with Massimo on our Pinot Noirs. Before planting a single grape vine or laying a building cornerstone, Brion spent a lot of time walking the property and sitting on overturned buckets considering what view he wanted from which place, and how the vineyard rows should be laid out. Then, with help from our friend John Caldwell, known in parts of Napa as the King of Clones, the estate vineyards were planted in 2002. In designing our home and the various winery buildings and outdoor areas, we found ourselves instinctively minimizing the usual boundaries between indoors and outdoors. We found a style that is not only comfortable and pleasing but also completely natural to this landscape, something we first enjoyed while visiting Italy and Provence and brought back with us to Sonoma. It seems a natural place to bring people and our wines together. We are very excited to announce that we will be hosting a wine dinner with DELAS next Thursday, March 21st at 7pm. These wines are extremely hard to come by and are delicious! One of the wines we will be tasting received 100 points from Wine Spectator! There isn't much wine to go around, so this dinner will be limited to only 12 Guests! For more information on this dinner, please see below or visit our website. In 1835, Charles Audibert and Philippe Delas purchased the Maison Junique wine merchant in Tournon-sur-Rhône, which they renamed "Audibert et Delas". In 1924, Henri and Florentin Delas took over the company which they renamed "Delas Frères". They continued to develop the trading business and the family estate by purchasing a vineyard in Châteauneuf-du-Pape and expanding the Hermitage vineyards in order to ensure consistent quality for their production. The introduction of oenological equipment tailored to the vinification and ageing requirements of selected wines has also contributed to the revival of Delas. In the vinification cellars, the old stainless steel vats have been replaced by small 85 hl concrete vats. These containers ensure that the batches of grapes can be separated, terroir by terroir, and enable a more effective temperature control. All of the work is now carried out using a gravity system. As the fruit is emptied into the vats by gravity, the grape berries are not subjected to pumping or any rough handling. The vats are fitted with hatches that enable the punching down of the cap to be carried out by hand in order to air the wine from the top. The vinification process can therefore be likened to a great Chef preparing his dishes on the stove. The ageing cellars have been completely renovated since 1996. The 2,500 hl of old casks have been replaced by 600 Burgundy barrels from world-famous coopers such as François Frères, Seguin Moreau and Damy. It is essential to have a relationship of trust with the cooper supplying the barrel because, although the wine benefits from the time it spends ageing in barrel, its organoleptic characteristics must not be overpowered by the oak. The barrel should allow the fruit of the terroir to express its unique personality. On the steeply sloping hillside vineyards, where man must be the "mason” of his own vines, the dry stone retaining walls have been painstakingly rebuilt in order to preserve the countryside heritage. 2015 proudly marks the completion of the reconstruction of these low walls which are so symbolic of the Hermitage hill. We are honored to welcome winemaker Christophe Paubert and his very special "Black Label" wines from Stag's Leap Winery! These are wines only sold at the winery and have never been showcased in a wine dinner before! Dinner is comped with the purchase of 6 bottles! We hope to see you on Tuesday! For Christophe Paubert, Winemaker and General Manager at Stags’ Leap Winery, the identity of a wine is found through the terroir. Christophe’s career has spanned the industry from sales to winemaking, and his impressive background includes positions at Chateau d’Yquem and Gruaud-Larose as well as projects in Chile, Spain and Washington State. But it was the terroir of Stags’ Leap that drew him to California. Today, Christophe’s winemaking philosophy is informed by the sum of his varied experiences: he makes wine the way he learned in France, to showcase the fruit and not the winemaker’s hand, but he applies a technical understanding of each and every step of the process. We are very excited to welcome the wines from ALBERTO ORTE IMPORTS to Tesse & Boutellier! Alberto has been bringing great wines into the US for 20 years and he is pulling out some of his best for this dinner! Olé Imports began in 1999 with just 3 wines. Our unique portfolio of Spanish wines has now grown to over 100 wines today. My dear friend and partner Alberto Orte and I have searched the Spanish peninsula for wines that share four fundamental elements: terroir, quality fruit, exceptional winemaking and last but not least, wines that present an exceptional value. “When Olé Imports began in 1999, there were only three wines in their portfolio, and one of the two founders, Patrick Mata (the other founder being Alberto Orte), was not even old enough to consume alcohol! A great success story, this tiny boutique company searches out, as they put it, “unique terroir-driven wines of extraordinary value.” Often such sayings are hyperbole, but not in the case of Olé Imports. Aside from the wine quality, one of the most admirable aspects of Olé Imports is their attitude concerning social responsibility. Readers are encouraged to check their web site, www.oleimports.com, to see the number of charities with which they are heavily involved, including some of my favorites such as the Wounded Warrior Project. 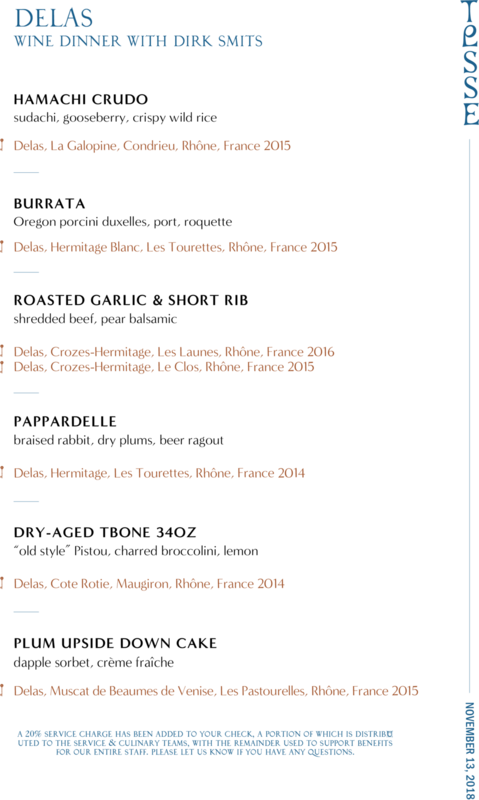 We are very excited to welcome the wines from DELAS to Tesse & Boutellier! These stunning Rhône wines are not to be missed! For years, these wines have consistently been given high ratings, of which are all deserved! Delas Freres is a winery of tradition and renewal. Founded in 1835 ago in the heart of the northern Côtes du Rhône, the winery enjoyed the dynamism of its original founders and their heirs and more recently, the renewed energy of the Lallier-Deutz family, owners of champagne house, Champagne Deutz. Delas Freres and Champagne Deutz were acquired by the Champagne House of Louis Roederer in 1993. Andre Lallier retired from daily winery duties in 1996, and Fabrice Rosset, a 20-year executive with Roederer, has taken the helm at both Delas and Deutz. Today, the Delas wines are crafted by a panel of experts headed by winemaker Jacques Grange. Together, the team makes wines that have been heralded for their intensity of flavor and excellent value. We are very excited to welcome MONTE REAL to Tesse & Boutellier! These wines from Rioja are just simply incredible! Anyone in attendance will get the special opportunity to try some library vintages going back to 1998!!!! These wines are very well priced and would make for some great holiday gifts! The Artacho family had a deep wine tradition when in 1890 they founded Bodegas Riojanas together with Rafael Carreras. Signs of this tradition are the stone door built in 1799 to provide access to the family vineyards and is now preserved at the entrance to our winery, and very specially the prizes awarded to their wines before that foundation, as the golden of the Universal Exposition in Barcelona in 1888. Bodegas Riojanas controls more than 300 hectares of vineyard. From the best vineyards in Cenicero, San Vicente de la Sonsierra and nearby towns. The red grape par excellence in Rioja is Tempranillo, but Bodegas Riojanas also has one of the largest areas dedicated to Mazuelo and Graciano within the Denomination, varieties that provide greater personality to their wines. We are very excited to welcome PORTER CREEK to Tesse & Boutellier! Winemaker Alex Davis will be in attendance showcasing his incredibly tasty wines from Sonoma! 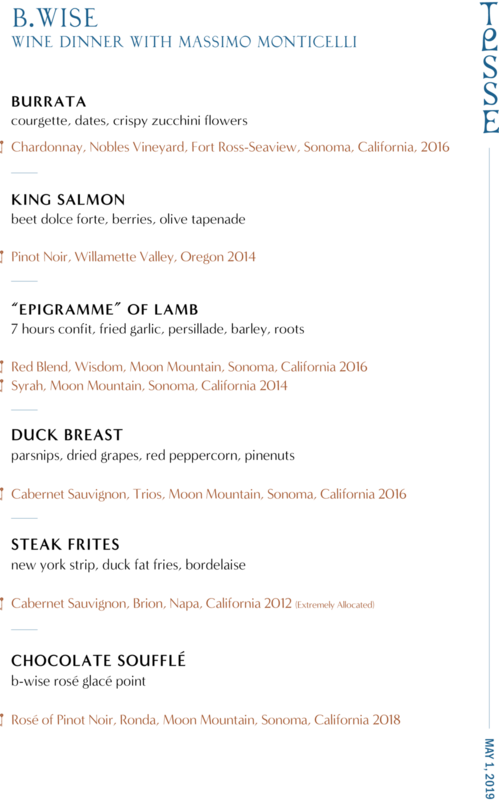 These wines are some of the best “bang for your buck wines” on the market right now, and we are very excited to be able to do a wine dinner with them! We are very excited to welcome SELVAGROSSA to Tesse & Boutellier! Winemaker Alberto Taddei is making some incredible wines in Le Marche….. These wines are insane! All of these wines are limited and hard to find because the production is so small! Selvagrossa, located in Pesaro’s foothills facing the Adriatic coast of Le Marche, is a very small estate with only five hectares of vineyards. Sangiovese, the area’s dominant vine, along with select international varieties, find a terroir favorable to the production of great wines with character. Brothers Alberto and Alessandro Taddei inherited the estate in 2002 from their grandparents, and the first Selvagrossa wine was made that same year from an old-vine Sangiovese vineyard planted in the early 1970’s by Alberto and Alessandro’s father and grandfather. We are BEYOND excited to welcome REALM CELLARS to Tesse & Boutellier! Owner Juan Mercado and Winemaker Benoit Toquette have something very special going on in Napa. These wines are insane! So insane that they are near impossible to get, let alone taste in a wine dinner! We are so excited that they have agreed to do a wine dinner with us. Seats for this dinner will be very limited, so book fast if you would like to attend! Making wine at the very highest level has always been at the core of Realm Cellars. Through “these blessed plots” – vineyards that we own and sites that we carefully curate – our aim is nothing less than to illuminate and reflect the pinnacle of Napa Valley winegrowing. But our vision for what Realm can be encompasses more than creating fine wine. Securing an enduring place in the history of Napa Valley, that is also our aspiration. Realm Cellars is a journey. Years ago, Juan laid the groundwork, risking everything he had to achieve his dream. In time, others took the baton, taking their own risks to rebuild the business when it needed it most and infusing Realm with a new vision of what the future could hold. Drawing on a shared ethos of entrepreneurship and an obsession with excellence, this team took Realm beyond an individual person, and way beyond Juan’s wildest dreams. As we look to the future, we see only possibility. Our Estate in the Stags Leap District gives us a firm foundation and ensures that Realm Cellars will be here for decades to come. We’ve come a long way, yet there is still much work ahead: a property to revitalize, vineyards to re-plant, a concept for hospitality to be realized, and of course, wines to be made. As we map our course, our promise - to our customers, our growers, ourselves - is that Realm Cellars will never be static, never complacent. We will make our mark in the firm belief that the best is always yet to come. We are excited to welcome Juan Alejandro Jofré from J.A. Jofré to Tesse & Boutellier! These wines from Chile, are very elegant and make very good every night drinking wines. 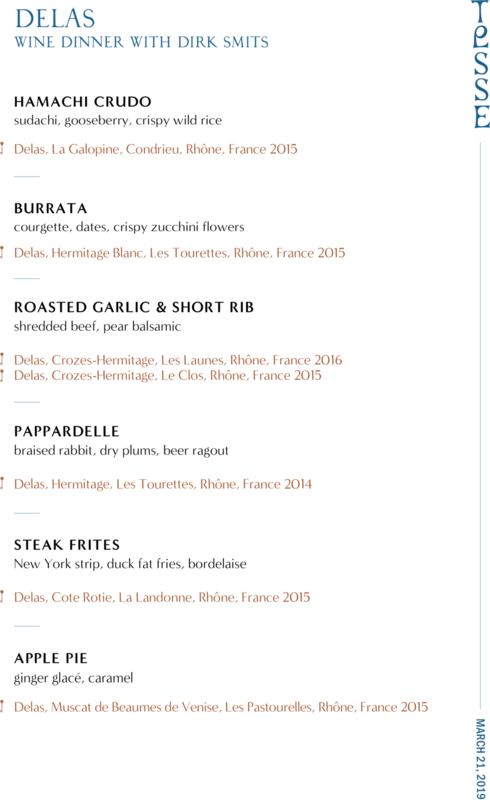 Chilean wines are some of the best value wines being made right now in the wine industry! Ten years ago, when the Colchagua Valley in Chilé was becoming famous for its high alcohol, rich and concentrated reds, Juan Alejandro Jofré was forging a new path with a very different style at Viña Maquis. During that decade with Maquis, he changed the viticultural techniques to align with his terroir hero, French consultant Xavier Choné, to be able to make lean wines with high acidity and low alcohol - sometimes picking a month before his neighbors. Jofré's wines bucked the trend back then and gained him critical acclaim as journalists and drinkers tired of overripe reds. While at first ridiculed by his neighbors, he soon became recognized as one of Chilé's most promising young winemakers. Wanting to push his style even more, Jofré left Maquis in 2013 to start working on his own projects. Jofré had his eyes on a region near and dear to his heart where his family has owned vineyards for many years - Curicó. In his words "I wanted to make these cool climate wines from Curicó because it is in the heart of Chilé, but a very mistreated region ... it has a bad reputation but I think it can be extraordinary for making wine..." Jofré is making two lines. His signature line, Vinos Fríos del Año; and his entry level line, Coronas del Sur. Jofré continues to pave the way, proving there is a much cooler side to Chilé. We continue to be impressed by the quality of wine Jofré is producing, along with his uncompromised dedication to his unique (delicious!) style. It just doesn’t get any more local than this! Yes, Sweetzer, as in West Hollywood! We are so excited to welcome winemaker Michael Fogelman and “master wine-pourer” Lisa Liberati to Tesse & Boutellier! 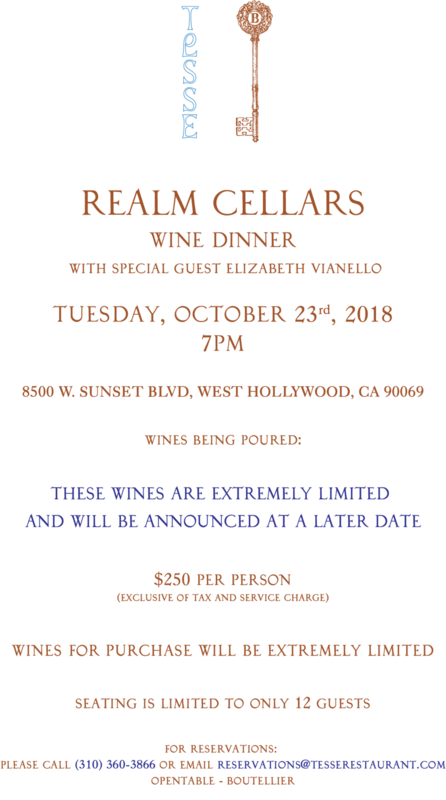 This is their VERY FIRST wine dinner in West Hollywood and will definitely be one not to miss! Inspired by a summer trip to France in 2008, they began making wine in a second story, white-carpeted apartment in West Hollywood. Blissfully unaware of the challenges facing them, they hauled Cabernet grapes from Napa and Sonoma. They crushed in the carport, fermented in the dining room, and pressed in the kitchen. The bedroom, kept at 60 degrees, served as the cellar. In 2011, they decided to try their hand at Pinot Noir, and it felt as if they had finally come home. By 2013, they were ready to share, which meant moving into a legal winemaking space and increasing their volume beyond a pair of 30 gallon barrels, but their philosophy hasn’t changed since their days on Sweetzer Avenue. Source the best available fruit grown by the best vineyard managers. Minimize intervention to let the grapes and terroir speak for themselves. Seek the perfect balance between fruit and earth, a quest that continues to inspire them to produce wines that we love to drink. We are excited to welcome Countess Ginevra Venerosa Pesciolini from Tenuta di Ghizzano to Tesse & Boutellier! These wines are very elegant and make very good every night drinking wines. You don’t need to be an Italian wine lover to enjoy these wines….they are soooo good! The "Tenuta di Ghizzano" (Ghizzano Estate) is one of the oldest farms in the area and also one of the most innovative. Today it is made up of about 350 hectares of which 20 dedicated to vines, 20 to olives, 150 hectares of cereal and the remaining 150 is made up of woods and poplar groves. Their aim is to cultivate a high quality product, limited in quantity and which fully reflects the characteristics of this area without forgetting the style, elegance and rich fragrances of the rolling hills which surround them. In 2003 they started to move over to organic farming and since 2008 have been officially recognized as organic by the relevant authorities. Please let us know of any allergies or dietary restrictions and we can make changes to the menu for you! In preparation for the holiday season, we are excited to announce our first Champagne dinner with Gilles Dumangin of Champagne J. Dumangin. This will be a wine dinner you will NOT want to miss as these champagnes are rarely tasted in a public setting, as the production is so small! Seats for this dinner are extremely limited, so book fast! We hope to see you on the 11th! The Dumangin family can be traced back to working in the vineyards since the 1650's. Champagne Dumangin was created by Hippolyte Dumangin in the 1890s in the 1er Cru village of Chigny-les-Roses. Jacky Dumangin, three generations later, perfected the characteristically feminine Premier Cru champagne range. His son, Gilles Dumangin, 5th generation of successful winemakers, expanded the domaine by introducing several high end cuvees that helped position his domaine. The installations for pressing and making the wines have been awarded the quality label by the CIVC. His press of 2000Kg combines modernism and tradition and is one of only two made of this type in the world. It crushes the grapes ever so delicately, with less pressure and more respect for the grape, adhering to the family philosophy of never "stressing" the grapes at any point in the production process. Further, Gilles Dumangin is one of the few producers in Champagne who utilizes enamel tanks in which the porosity maintains a signature yeast component cuvee after cuvee.